As the year passes, our Firefly kids continue to grow in stature and in confidence. It’s hard to believe that four of the boys are now taller than me! As most of you know, I was in Nepal during September and spent time connecting with the kids; the oldies and the newbies. We played with the newly donated handballs, danced, sang, played interactive games like knucklebones, hopscotch and bull rush. We had lots of fun and retreated to the library when the Kathmandu heat became too much for us! I enjoyed my visit to the school principal and discussed with the children’s teachers the progress of each child. Overall I am astounded by the children’s enthusiasm towards learning and their dedication towards study and homework. 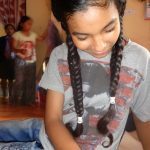 Many children arrive at our home with no English or Nepali; communicating only in one of the many dialects of Nepal. Within weeks they are speaking English and in a few months writing basic phrases. One of our 14-year-old girls, Nishu, got distinction (top in the school) and has skipped two grades. Many others are excelling in their chosen subjects with English, Art and Physical Education being the clear favourites. Being able to speak fluent English broadens the children’s horizons in a nation like Nepal. They are able to pursue a career in the many facets of the tourism industry that the country thrives on. Technology and social media has opened up their developing world to new industry and having English under their belt is a true gift. A highlight of this trip was travelling to East Nepal to spend time with Bijay, the oldest of our Firefly kids who is now 22. Bijay came to us as an orphan when he was 8 years old. When he finished school he did an apprenticeship in bio-farming and permaculture. 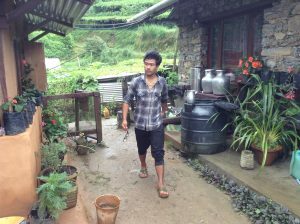 Now he is based in Ilam, near the Indian border, completing a 2-year online Diploma in Permaculture. He is helping to build and maintain an organic, sustainable farm in the beautiful mountain terrain of Eastern Nepal, where he is also assisting to build a children’s home complete with its own water source and fruit and vegetable patch. His day goes from feeding the cows to planting seedlings, clearing out water pipes, harvesting quinoa and creating mud ovens. He is truly content with the path he has chosen and has great plans about developing a tea garden mountain tour for tourists, of which he gave me a trial run. It was brilliant! The micro tea factory taught me a lot about the process of making tea and the organic meals were truly delicious. I am so very proud of him and he is extremely thankful to the Firefly supporters who enabled him to get an education and have a bright future. He is but one of the many Firefly success stories! The children who have spent over a decade with us together as siblings, are all so different in personality and character, yet they weave in together beautifully with such an acceptance and love for each other. Of the original 15 children, six of them have left home to engage in tertiary studies, marriage and apprenticeships. The next dozen is going to finish school over the next year or two and are greatly inspired by those Firefly kids who have gone before them. We sat down and discussed future options and put things in place for next year. I will endeavor to update sponsors on the progress of their child over the coming weeks. Another highlight of mine was watching seven of the teenage girls choreograph a dance together for the Interschool Dance Competition. 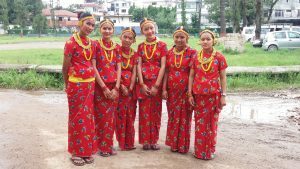 In two days they pulled together a traditional Nepali dance and performed so gracefully in their hired costumes. I was super proud of their dancing ability but mainly their comradeship. As I always do, I made visits to several prisons to deliver food items and clothing. Some of our children spent their early years in these prisons so it was lovely to show the mothers some photos of their children happy and healthy in our Firefly home. At Sankhu, where 50 of our sponsored children live, the gardens are producing fruit, herbs and spices and a few vegetables. The 11 goats produce milk to sell down in the village. We are slowly working towards sustainability with the intention of the children being trained in farming and permaculture to help produce the food they live on. When a child reaches 14, we give them the responsibility of caring for a younger child; ensuring their hair and clothes are washed weekly, their homework is complete and medication taken. The team of 22 older boys and girls who are assigned a child or a small group of children do a marvelous job at nurturing their juniors especially with limited to staff to help out. Dashain, the big annual Nepali celebration – like our Christmas, is just around the corner. The children are preparing for a month off school although they get a little bored without it! However, they look forward to the special meal and a new set of clothes that is traditionally given at Dashain time. For those who have a parent in prison, we will transport them to the jail for a couple of days to be with their mum or dad. Others stay back at the home, which is a rural treasure, and interact with the foreign volunteers. One current volunteer from the US, a young piano teacher, is spending 10 months at Firefly with a goal to teach music to the children and then perform as a band in a few months’ time. He is creating instruments from natural resources and the kids are keen and interested to learn and take part. We are forever thankful for the creative and loving volunteers who help at our homes. Perhaps the most important and inspiring meeting I had (among many!) 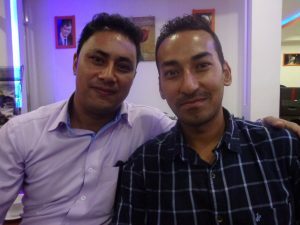 was with two Nepali guys who have set up their own hotel in Kathmandu. Keen to give back and help the vulnerable children, Prashant and Jashon have huge humanitarian hearts. I will be working with them over the next year to produce a hotel management training course for our older Firefly children, to provide hands on work experience in the hotel industry. It is on the cards to establish a hotel entirely run by the orphan children. “When I met the kids at Firefly, they are just like me except less fortunate. I want to give them the opportunities I have had,” says Prashant. Personally, it was inspiring to meet like-minded people who consider these kids’ lives precious and worth making a stand for. Thank you for your continued support. My wish is that you understand what a huge difference your contribution and interest is making to these children’s lives!